The induction of autoantibodies to U1 small nuclear ribonucleoprotein (U1 snRNP) complexes is not well understood. We present evidence that healthy individuals with cytomegalovirus (CMV) infection have an increased frequency and quantity of antibodies to ribonucleoprotein, directed primarily against the U1-70k protein. A significant association between the presence of antibodies to CMV and antibodies to the total RNP targeted by the immune response to the spliceosome (to both the Sm and RNP; Sm/RNP) was found for patients with systemic lupus erythematosus (SLE) but not those with mixed connective-tissue disease. CMV thus may play a role in inducing autoimmune responses in a subset of patients with systemic lupus erythematosus. The role of viral infections in the pathogenesis of SLE and other autoimmune diseases has long been debated. Herpesviruses such as Epstein–Barr virus (EBV) and CMV have been of particular interest because of their ability to interact with the immune system in a variety of ways, as well as their ability to establish latency with the potential for reactivation. Both human and murine CMV infections have been associated with autoimmunity [1,2,3,4,5,6,7,8,9,10]. CMV can be transmitted in utero with both primary and reactivated maternal infections, a feature that accounts for the inordinately higher incidence of congenital CMV infection than of other intrauterine viral infections . About 30,000–35,000 US infants (1% of live births) are born annually with congenital CMV infection . Neonatal CMV infection is one of the leading causes of mental retardation . Vaccination of young women of childbearing age is a logical approach to preventing neonatal CMV infections. The major envelope glycoprotein of CMV, referred to as gB (also known as gpUL55), has been the primary focus of subunit vaccine studies because of its strong immunogenicity [13,14,15,16,17,18,19]. This protein is conserved throughout the herpesviruses [20,21], plays a role in cell entry and cell-to-cell dissemination , and may also determine cell tropism . There appear to be at least two cell-surface receptors for gB, including heparan sulfate proteoglycans . Interestingly, gB also binds to annexin II , a phospholipid-binding protein, which is located intra-cellularly, although cell-surface and secreted forms of annexin II have been identified , and this interaction may account for CMV-induced antiphospholipid antibodies [7,27]. Additional viral proteins and coreceptors are required for CMV penetration and fusion . The complexes of U small nuclear RNAs (U snRNAs) and their associated proteins are highly conserved and are essential for the splicing of precursor messenger RNAs. Almost all U1 snRNP proteins are targets of autoantibodies (for review ). The antibody response to snRNP gives a speckled immunofluorescence pattern and targets the proteins U1-70k, U1-A, and U1-C, which are uniquely associated with the U1 snRNA, with the predominant response being to the U1-70k protein . In previous studies, we found that intraperitoneal injections of an adenovirus recombinant expressing CMV gB (Ad-gB) induced IgG autoantibody responses to the U1-70k spliceosome protein in both autoimmune and normal mouse strains . Similar autoantibodies are typically detected in patients with SLE and mixed connective-tissue disease (MCTD). While anti-U1 snRNP autoantibodies are found in patients with MCTD and SLE, antibodies to ribonucleoproteins recognized by antibodies from a patient named Smith (Sm), which react with the B'/B, and D proteins as well as with the E–F–G complex (the common core proteins of U1 snRNP and other U snRNPs) [29,30], are detected mainly in patients with SLE (in 20–30% of such patients). Antibodies to U1 snRNP in the absence of anti-Sm are found in <10% such patients . In MCTD, the antibody response to Sm is rare [31,32]. In the present study, we investigated anti-RNP and anti-Sm responses in adults with and without CMV infection as defined by antibody status. In addition, we characterized the CMV antibody response in patients with autoimmune diseases. The results suggest an association between CMV seropositivity and the immune response to U1 snRNP. Anonymously coded specimens of serum from 100 healthy individuals (80 females), aged 18–50 years (98 whites, 1 Asian, and 1 African American) were obtained from the University of Louisville. These individuals, none with symptoms of acute CMV infection, had been screened for participation in various vaccine studies, and thus those that were positive for anti-CMV antibodies would be classified as latently infected. Sera from 40 patients fulfilling the criteria for SLE  were kindly supplied by Dr Paul Fortin and Dr Ann Clarke, at the Lupus Clinic, the Montreal General Hospital. Half of these sera were either Sm/RNP-positive or -negative as previously determined by enzyme-linked immunosorbent assay (ELISA) (Inova Diagnostics, San Diego, CA, USA). Sera from patients fulfilling criteria for MCTD, dermatomyositis, or polymyositis were obtained from clinics of the medical school at the University of Nijmegen, The Netherlands. Total CMV-specific IgG was measured by ELISA (Cytomegalovirus IgG ELISA Kit; INCSTAR Corp., Stillwater, MN, USA). IgG antibodies to gB were measured by ELISA using a modified gB protein containing the major linear neutralizing domains AD-1  and AD-2  but lacking heavily glycosylated intervening regions and transmembrane and cytoplasmic domains . This construct was used because it was available. This protein was expressed in insect cells by recombinant baculovirus to preserve co- and post-translational modifications. Briefly, 96-well plates (Corning Costar, Kennebunk, ME, USA) were coated with clarified baculovirus-infected cell lysates diluted 1:2000 in phosphate-buffered saline solution (PBS; 50 μl/well) and then blocked with 1% bovine serum albumin. Sera were diluted in buffer consisting of 0.05% Tween-20 and 0.25% bovine serum albumin in PBS and incubated in the antigen-coated wells for 1 h. After being washed, bound antibody was detected by horseradish-peroxidase-conjugated goat anti-human IgG (Biosource International, Camarillo, CA, USA) diluted 1:750 in PBS/0.05% Tween-20 (2 h incubation) and conversion of 2,2'-amino-bis(3-ethylbenzthiazoline)-6-sulfonic acid as measured by optical density (OD) at 405 nm. Each serum specimen was assayed in two wells containing recombinant baculovirus-infected cell antigens and two wells containing antigens from cells infected with parental baculovirus. Specimen OD was taken as the difference between the average gB signal and the average background signal. AD-1- and AD-2-specific monoclonal antibodies were reactive in this assay. Samples were considered positive if they were above the cut-off of 0.4, which was the mean OD +3 SD from 332 CMV-seronegative sera. Sera were routinely tested at 1:100 dilution and the resultant OD was used as a quantitative measure of antibody to gB epitopes. ELISAs were used to detect anti-Sm or anti-RNP IgG response as previously described . The target antigen was calf-thymus Sm or RNP (Immunovision, Springdale, AZ, USA). Antibodies specific for the amino-terminal fragment of recombinant U1-70k protein were also measured by ELISA as previously described . For these assays, internal standards allowed the comparisons between ELISA plates. Because we were measuring the levels of autoantibodies in normal individuals, the cutoff value was the mean + 2 SD found in 15 normal individuals known to be CMV-antibody-negative from a pilot study, rather than unselected normal individuals. However, the CMV status of the normal individuals in this study was not known prior to the analysis. The data were also analyzed using a cutoff value of the mean +3 SD for this cohort of 100 individuals. Sera that were positive at a 1:200 dilution were serially diluted to 1:8000 in order to determine the antibody titers. To determine the specificity of the U1 snRNP autoantibodies in high-titer responders, purified calf-thymus Sm and RNP (ImmunoVision) were used as substrate. Purified Sm/RNP proteins, 1.5 μg per lane, were resolved on 10% SDS–acrylamide gels . The proteins were transferred to nitrocellulose strips (Micron Separations Inc., Westborough, MA, USA) as previously described . Following transfer, the strips were blocked for 1 h in PBS–Tween and then incubated with selected sera diluted 1:2000 in PBS–Tween for 2 h at 37°C. 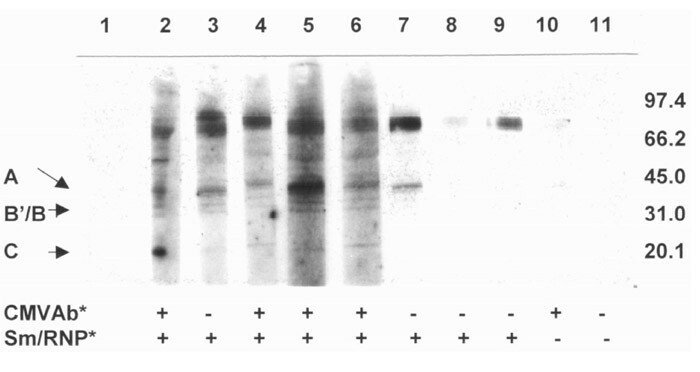 After three washes with PBS–Tween, the strips were incubated for 1 h at 37°C with horseradish-peroxidase-conjugated F(ab')2 fragments of anti-human IgG diluted 1:15,000 (Jackson ImmunoResearch, West Grove, PA). After this incubation, the strips were washed five times with PBS–Tween, and bound antibodies were detected using a chemiluminescence substrate according to the manufacturer's instructions (Western Blot Chemiluminescence Reagent, NEN, Boston, MA, USA). The strips were exposed to Biomax MR Film (Kodak, Rochester, NY, USA). The statistical tests used included linear regression analysis, χ2analysis, and Fisher's t-test, as appropriate. Table 1 shows antibody responses to RNP, Sm, and U1-70k among healthy adults with and without CMV infection. There was a highly significant association between CMV infection and the presence and level of such autoantibodies. There was, however, no linear correlation between antibodies to RNP, Sm, or U1-70k and antibodies to the modified gB molecule that contains AD-1 and AD-2 but lacks the heavily glycosylated portion and is truncated at amino acid 646 (r = 0.029 for antibodies to RNP versus gB; r = 0.006 for antibodies to Sm versus gB; r = 0.029 for antibodies to U1-70k versus gB). This suggests that the putative site of mimicry is not present in this molecule. aBased on mean + 2 SD. bAmino-terminal fragment. Compared to the usual methods of assigning a cutoff value from unselected normal individuals, the cutoff used for autoantibodies in this study is lower, based on a pilot study. This allowed us to discriminate within the normal group. Thus the apparent proportion of positive sera at a dilution of 1:200 (Table 1) is higher than that previously reported. As can be seen in Table 1, the mean OD of autoantibody responses is significantly higher in individuals who have anti-CMV antibodies. Autoantibodies to the U1 snRNP proteins, however, were also detected in a subset of CMV-negative individuals. When the data were analyzed with the cutoff value of the mean +3 SD, 8 sera were positive for antibodies to U1-70k, with 7/8 CMV-positive and 1/8 CMV-negative. Of the 100 sera, 5 were positive for antibodies to RNP with the more stringent cutoff value, and all 5 were CMV-positive. For Sm, 10 of 100 were positive for antibodies to Sm when the cutoff value was the mean +3 SD, with 7/10 CMV-positive and 3/10 CMV-negative. Anti-Sm/RNP titers were also examined in this group of normal individuals. Of the 100 healthy individuals tested, 18 had a high-titer response to Sm/RNP of greater than 1:1000, which was analogous to that seen in the SLE patients tested. Thirteen of these individuals were CMV-antibody-positive (10 females, 3 males) and 5 were CMV-antibody-negative (2 females, 3 males). In one patient for whom serum was available before and after CMV infection, only the postinfection serum was positive for IgM anti-Sm/RNP autoantibodies when tested by ELISA and a standard Ouchterlony immunodiffusion technique (data not shown). Of the normal individuals tested with autoantibodies to the spliceosome components (when using the mean plus 2 SD cutoff), 7 individuals were positive for antibodies to the spliceosome in all three assays, 5 had positive results in two assays, and 21 had only one one positive autoantibody assay (15 of the 21 were positive for U1-70k only). In contrast, of the SLE patients who had positive tests for the anti-spliceosome antibody, 18 of 23 had positive results in all three assays. We measured the total serum IgG levels by ELISA  in the autoantibody-positive versus antibody-negative and found that the mean levels were not significantly different (15.42 ± 5.27 and 15.54 ± 7.25 mg/ml, respectively). Surprisingly, the individuals with the high-titer response to Sm/RNP had a mean IgG of 14.73 ± 5.00 mg/ml, suggesting that polyclonal activation was not responsible for the detection of the high titer. The mean serum IgG concentrations in the CMV-antibody-positive and -negative individuals were 16.56 ± 7.30 and 14.32 ± 4.9 mg/ml, respectively, which were not significantly different. Simple linear regression analyses in the cohort of 100 healthy individuals (both CMV-positive and -negative) indicated r = 0.566 (P < 0.0001) for the anti-RNP versus anti-Sm response; r = 0.559 (P < 0.0001) for the anti-RNP versus anti-U1-70k response, and r = 0.317 (P = 0.0013) for the anti-Sm versus anti-U1-70k response, indicating high correlations. The relatively low r values indicate the complexity of these immune responses and the multiplicity of proteins (and epitopes) in the spliceosome that are targeted. This complexity is illustrated in Figure 1: antibodies from both the SLE sera and normal sera target multiple proteins in the Sm and RNP preparations. However, the predominant response was toward the U1-70k protein. Antibodies from SLE and normal sera from CMV-antibody-positive and -negative individuals target primarily the U1-70k protein in the spliceosome as determined by immunoblot analysis. Lane 1, second antibody control; lanes 2 and 3, SLE sera; lanes 4–11, sera from normal individuals. Sm proteins A, B'/B, and C are designated on the left. Molecular-weight markers are designated on the right. All sera were diluted 1/2000. *As determined by ELISA. Having observed an association between CMV antibody positivity and autoimmune responses to the U1 snRNP proteins, we were interested in determining the CMV-antibody status of patients with autoimmune disease who have antibodies to Sm/RNP. There was an excellent correlation between the assay used in the present study and the prior autoantibody status as determined by the Quanti-Lite ELISA (Inova Diagnostics; data not shown). As can be seen in Table 2, about 60% of the patients with disease had antibodies to CMV, a proportion similar to that found in the general population . The MCTD group had a CMV-antibody frequency of about 40%, which is low. In the SLE group only, there was a significant association between CMV status as measured by circulating IgG antibodies and the anti-RNP response. The lower P value for this group than in the healthy controls may reflect in part the smaller size of the group. Analysis of the immunoblots showed that there was a more diverse antibody response to the Sm/RNP proteins in the SLE sera than in the normal individuals (Fig. 1, and data not shown). *Not available. DM, dermatomyositis, ns, not significant, PM, polymyositis. We have found an association between autoimmune responses to the U1-70k protein and CMV infection, both in normal individuals and in patients with SLE. The frequency of antibody to U1-70k has been reported to be 30–40% in patients with SLE , and 90–100% in patients with MCTD, where anti-snRNP is a diagnostic criterion (for review ). The frequency of the presence of this antibody in African Americans and Asians is about twice that in whites . Since both the cohorts of normal individuals and SLE patients were about 98% white, this ethnic difference in phenotypic response does not complicate the analysis of our data. There have been only limited reports of the frequency of autoantibodies to anti-Sm/RNP, in small groups of the general population. The reported frequencies range from 0–10% [39,40]. In our cohort of normal individuals, the frequencies of high-titer (>1/1000) anti-Sm/RNP responses were 26% in the CMV-positive group and 10% in the CMV-negative group (18% overall). Neither of the Asian nor African American individuals was in the high-titer-responder group. These high-titer sera were positive against Sm, RNP, and recombinant U1-70k in ELISA and also against U1-70k in immunoblots and appeared more SLE-like than MCTD-like in their reactivity. The U1-70k protein is often the first U1 snRNP protein to which autoantibodies develop in serially followed patients with SLE , and this appeared to be the most common 'solo' autoantigen in the normal individuals targeted. In a study of autoantibodies in sera that predate the diagnosis of SLE, antibodies to Sm and RNP can be detected in approximately 40% up to 8 years before diagnosis . Thus, it is possible that some of these normal individuals with high-titer anti-Sm/RNP responses, who have a genetic susceptibility for autoimmunity, may develop SLE over time. It is intriguing to think that with periodic reactivation of CMV, this autoantibody response could be boosted, and such individuals may be at risk of developing SLE in a shorter period of time than those that have the anti-U1-70k response in the absence of CMV infection. However, we cannot rule out other herpesviruses (such as herpesvirus 6 and 7 [20,21]), which have highly homologous gB proteins (approximately 26% amino acid identity, with 45% homology at the protein level and 70% at the nucleotide level), from having a role in the development of this autoimmune response. These viruses can also cause latent infections and periodically reactivate. From our murine studies, molecular mimicry may be responsible for the induction of the autoimmune response . The autoimmunogenic epitope in gB is likely to be located between amino acids 700 and 907 (Newkirk, manuscript in preparation), where there are similarly charged amino acids to the carboxy terminal region of U1-70k. The region 700–907 was not present in the modified gB molecule used in the current study. We found that approximately 60% of the adult SLE patients had evidence of anti-CMV antibodies, which is similar to the frequency of infection seen in the general population. Previous reports have varied from 42–90% (teenage to adult) [43,44]. In contrast, in the small group of patients with MCTD, there was no discernible correlation with CMV infection. This latter finding, however, does not rule out a role for the gB from other herpesviruses in the induction of an anti-RNP response in MCTD. Disease features that are significantly increased in SLE patients that have circulating autoantibodies to Sm and /or RNP when compared to SLE patients lacking these autoantibodies include: Raynaud's phenomenon, arthritis, and mean number of nail fold capillary loops . In addition, anti-Sm/RNP antibodies have been linked to late-onset renal disease . Thus, these autoantibodies appear to define a distinct clinical and serological subset of SLE patients. Since antibodies to Sm/RNP can precede the disease for many years , their precise role in the pathogenesis is unclear. It is likely, however, that autoreactive B cells could contribute to the spreading of the immune response to other epitopes or determinants by aiding in the endocytosis and presentation of linked autoantigens, in a genetically susceptible host. The data presented here suggest that studies of gB subunit vaccines in humans should include assays for the analysis of possible autoantibodies after vaccination. We acknowledge the technical assistance of Gordon Stout and Nicole Saba. The research of WJvV is supported by Het Nationaal Reumafonds of the Netherlands and by the Netherlands Organization for Scientific Research (NWO).